Our readers are our writers! Email us a writeup and photographs of your cruise and we'll send you a travel voucher, to discount the price of your next cruise. 9 August 2013. Rating 5/5 : This is an account of the 11 days cruise departing Cape Town to Walvis Bay and St Helena Island on the MSC Sinfonia taken by my wife & I. Visiting St. Helena Island had been on our bucket list and we had looked at how to get there, but the solutions were expensive until MSC Cruises added this cruise to their itinerary. We expected it to be very popular and booked the cruise as soon as bookings opened. Two weeks to departure I looked at the MSC website to see that they were offering a "LOTTO SPECIAL" and one could book a ticket at a lot less than the going rate and therefore our friends joined us. Now all panic, new clothing was needed requiring lots of shopping and dress making. The weekend before departure, we were informed that the boat would be leaving at midday, instead of 16h00 and we had to be on the board by 11h30. This was because they expected rough seas. This meant that we only arrived a half hour before departure. This was great as there was no waiting. We were welcomed aboard and directed to our cabins and before we could make up our minds what to do next we had a call to carry out lifeboat drill before departing the dock. We had to go to the casino and were given safety instructions in case we needed to abandon ship. Once this was completed we went back to the cabin to drop off the life jackets, and joined our friends at the Galeona Restaurant for lunch. We sat near the window (these windows are too big to call port holes) and watched the preparations for our departure while enjoying a lovely meal. We took an inside cabin as it was cheaper and except for no window it was the same as the cabin with a window. We only use the cabin to sleep, shower and change so why does one need a window or balcony? Hint, get the cabin steward to make up your room as 2 separate beds as this moves the floor space to the centre of the cabin and therefore one has more usable room. After lunch we went on deck to watch Cape Town fade into the distance. Next we explored the ship, registered for the Gym and looked at the Turkish baths and relaxation room. They had some great deals for massages and if you booked one you could use the Turkish baths at no cost for the rest of the cruise. We booked a double massage for the following day. This proved to be a good idea as we used the Turkish bath and facilities virtually every day. There is a 24 hour self-service for tea, coffee, water and crushed ice. A snack area is open 24 hours serving pizza most of the time and then depending on the time of the day, croissants, Danish pastries, sandwich rolls. What they dropped was the midnight snack, which I thought was a great idea as we never went to it after our first cruise. They still had the Grand Buffet which is mentioned later. could repeat all that he told us but I think the most important thing I learned was that Walvis Bay is on fresh water aquifer which was formed by the sand dunes. This was a worthwhile tour and the quad bikes are great to tour a desert. Although we were in a desert the temperature was not hot and we needed to wear jeans and jackets. We got onto the quad Bikes and left the office area and within 50 metres we were driving in the desert. Fanie first took us to a small dune, about 1 metre high and showed us how to ride down a dune and also explained that the leeward side of the dune is always 34 degrees as above this angle the sand slides down to meet equilibrium so if one can cope with a 1 metre dune one can cope with any size dune. On we went into the desert and visited a number of interesting sites that he had identified. We also examined the vegetation, and the animals and insects of the area. Fanie caught a beetle and we were told that the grooves down the beetle's backs are used to collect water and they stand with their rear up and the moisture flows down their backs and they collect and drink it. The beetle is a Namib Desert Beetle or Stenocara. Next we were taken to a midden and old graves estimated to being around 2000 years old. There were a large number of beads all over the area. They are made from copper, bone shells and stone. There was also broken pottery and shell, bones stone tools. We were also shown 2 skulls, the first of people who died during the same period. One was a skull similar to the modern man and had sutures on its cranium, while the second was a smooth skull of a more prehistoric man. Fanie said it is possible the smooth skull was from the Topnaar who initially lived in this area and the modern skull from Khoi-Khoi who possible followed the Kuiseb River from inland. The middens have been hidden for years under the dunes. He also took us to an area that once was mud flats and on it we saw the foot prints of ancient man and a vast number of animals that must have roamed the Kuiseb Delta before it was covered with sand. While riding we also saw in the distance springbok and jackals. It is remarkable to see game in such a dry place. We needed to go down a 35metre high dune to reach the next site where we were shown artefacts and this site was also at a low level. Fanie dug down and within a metre he obtained water which tasted good. We returned via a Topnaar's home in the desert where one could purchase a small painting done by them. Here we had a view of Walvis Bay with the Sinfonia in the background which was taller than any of the buildings. We then returned to the tour office. After the 3 three hour Quad bike tour we got a lift to the Raft Restaurant where we had a late snack of Walvis Bay Oysters and Brut Sparkling wine. We admired some pelicans and flamingo that were near the Raft Restaurant. Afterwards we took a walk back to the Ship. What a great day! We cruised for 2 days during which we relaxed by spending time in the Turkish baths, reading, eating and going to the live shows. We arrived early morning at St Helena and we were up on deck to take pictures and be available for the first tender ashore. The Captain first went ashore to assess the safety of getting the passengers ashore. Well we waited, the captain spent over an hour on the jetty and in the end an announcement was made that the landing will be too dangerous, as the swell was too great and we will be departing immediately. There was a great moan and we were disappointed but this is the chance one takes. The captain negotiated with the island and MSC head office, and a decision was made for us to wait until the Monday morning as they expected the weather would improve. If this was the case, we could go ashore for a half day and we would sail back at top speed so as to get back to Cape Town on time. From the ship one could see the waves crashing against rocks and shooting up about 5 metres. I monitored the waves all day and they did not seem to be getting less and I was quite pessimistic about the shore excursion the following day. After a frustrating day and another queue for tender tickets, I managed again to get ones for the first tender. Once again up early and we got dressed and up to the top deck for breakfast but before eating, we had a close look at the waves against the rocks and it did looked a lot calmer than yesterday. 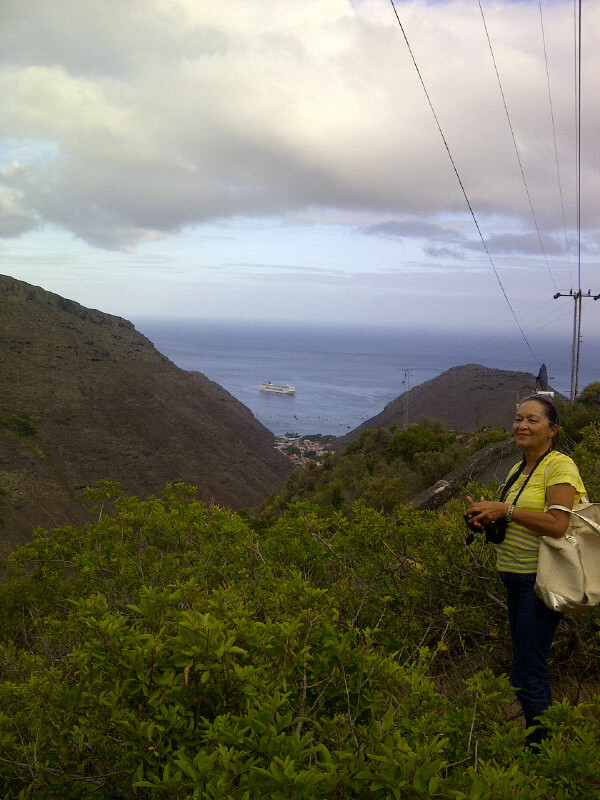 The shore excursion was on! We had breakfast and were ready for the first call which was before 06h00. 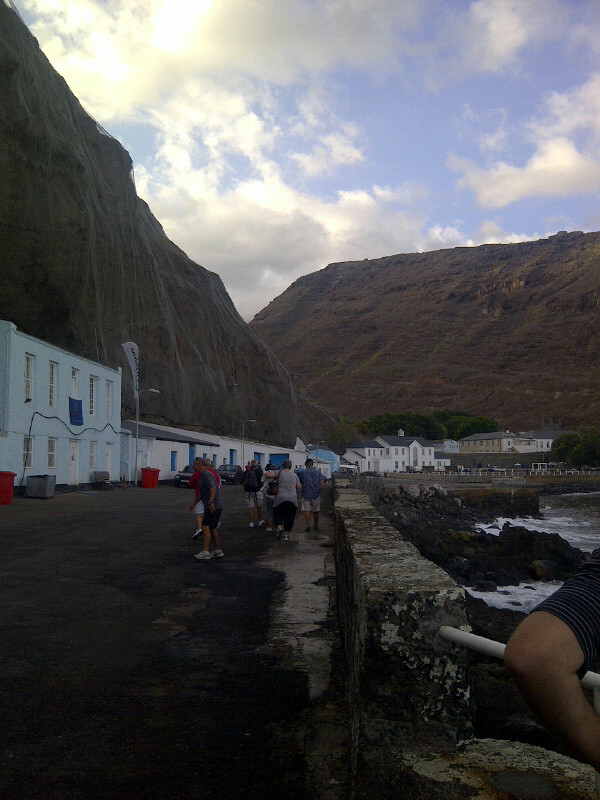 We boarded the tender and motored to the jetty at St Helena. When arriving at the jetty we realised how bad it must have been the day before, the tender was running up and down the jetty at least 2 metres and changing in height by about half a metre. We were assisted ashore and then I quickened my pace so I could organise a car, etc. My wife and our friends continued at a more sedate pace. As last tender was to leave at 12h30 we wanted to get as much done in the shortest possible time. As I walked, I took photographs of anything I thought was interesting. I arrived at the tourist information half expecting it to be closed but "The Saints", what the islanders call themselves, pulled out all the stops and the office was open and they phoned the guy hiring the cars and he said that he will be there in 30 minutes. Next I needed a temporary driver's licence but the police station was closed. I went to the Jail and they sent me to the post office. This might sound like a run around but all these premises within 100 metres of each other. I found the rest of the group and updated them then and went to the post office where they were setting up extra tables for the sale of stamps. I spoke to one of the ladies and she said she would arrange it and I went back to the St Helena Tourist offices to look at their maps, etc. and collect as much info as possible. While there the lady from the post office came to me and said I could come and get a temporary drivers after filling out the form and paying my ten pounds. It cost more than my 5 year licence in South Africa! Then back to the tourist office where I filled out an insurance form for the car. St Helena Information office site is The car arrived; it was a Ford Focus, a comfortable car for 4 adults. Our plan was to take a quick drive around a circular route and visit Sandy Bay a beach on the other side of the island. Off we went through the town and up out of the valley on the left side. The road is narrow and there are places where the down going cars would wait while the upcoming cars have right of way, this is one of the St. Helena Rules of the road. Although we did not plan to stop at Longwood, we ended up doing so and spent a few minutes looking around the house. You realise there how short Napoleon was and the way they slept half sitting up! We then travelled on through winding roads and lush vegetation to a village shop on Silver Hill. One is never far from the sea and the rugged coast and each mountain has an English name like Sugar loaf, The Barn, The Haystack etc. We drove through the Diana's Peak national reserve on a windy road, the vegetation was lush. The turnoff to Sandy Bay was a sharp left hand turn which I needed to carefully negotiate; the road ran down hill through many tight bends and towards Lot and Lot's Wives (peaks). We stopped to have a look at Sandy Bay Baptist Chapel with Lot in the background. We drove on down the valley with Lot's Wives high on the right side. Sandy Bay landscape was created by the South–Western volcano and carved by physical elements. Around the bay is fortifications that were built in Napoleon's time and during the Second World War. It looks like there are some interesting walks in the area but our time was limited. We drove out of the valley and continued on our circular route to the governor's house and although we managed to see Jonathan, a Seychelles Giant Tortoises. We then drove up to High Knoll Fort built in 1796 to protect the population in case on invasion. Unfortunately it was closed. Next stop was on top of Jacobs Ladder (Ladder Hill), where we had a quick look at the fort. Our final leg was downhill and back to the jetty to drop off our friends. We then returned the car. The car hire total car hire including fuel was £20. This was very reasonable for a morning outing for 4. We boarded the last tender to return to the Sinfonia after a great visit and we would love to go again and if possible spend a few more days. Once on board they soon weighed anchor and we started our return trip to Cape Town. I stood on the deck and watched as we sailed away from the Island and hoping that I will have an opportunity to visit again. The return trip was all against the wind and the ship was running at full speed. It has not pleasant to walk on the deck as the wind was most of the time 35 or more knots. We had a very relaxed return trip. Getting up and going for a leisurely light breakfast. Next going to the gym and then about a half hour in the Turkish bath and then relaxing and reading our books. We tried to find a spot outside near the pool but it was cool and windy so the relaxation room next door to the gym became our favourite spot. We would have a light lunch being rather picky in what we ate so as to try and keep our weight down. The afternoons were spent either joining in some of the entertainment or reading again normally in the top deck area at the back of the ship, the Pasha Club disco which was only used at night. We would go for a shower change and meet our friends on deck out of the wind for a sun-downer. Then to the show then afterwards we would normally meet friends in one of the lounges and have a dance or two, Try an Italian wine and finally to the late dinner. The second sitting dinner is a relaxed dinner in that they are not in a hurry to get the dining room ready for the next sitting. After dinner we would normally go to bed although most evenings I took a walk around deck. We also had a second double massage that was relaxing and enjoyable. We were very fortunate in that we had no bad weather on the whole trip. On the last night there was a Grand Buffet at midnight where a magnificent display of food was set out, it was well photographed and then eaten. Again we did not eat as we had already eaten too much. We arrived in Cape Town early Friday morning and had to vacate our cabins by 06h00. I was up early to watch sunrise and the arrival at port. We took our carryon bags to La Terrazza Buffet where we had a leisurely breakfast while the captain brought the Sinfonia into the harbour. We ignored the rush to line up to get ashore and chatted to our friends while waiting for the queues to reduce before disembark. The trip was very good and the best I have been on and I would give it 5 out of 5. 1. The arrival/ departure hall at the harbour could be easily improved on and also the control and parking should be looked at. 2. I would like a better selection of draft beer. 3. Wine prices are high and I think that a selection of the better quality SA wines would be good if they were mark them up the same amount in Dollar terms as the cheaper wines that are supplied, one would then feel they were getting better value for their money. 4. 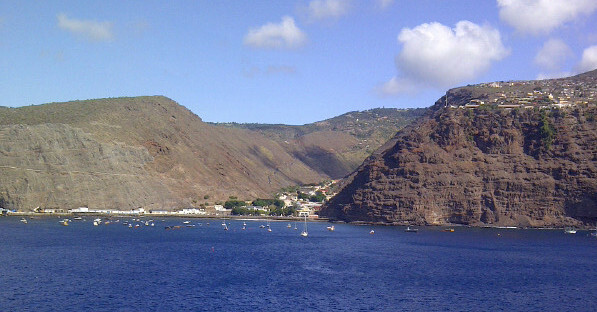 No cruise to St Helena next year. I hope MSC run it again as I would like to visit the island before the airport is opened and it becomes a tourist trap. 5. The bedside lights in the cabin are poor. We find this a problem in most hired accommodation and we recommend that one takes LED head lamp with you. 1. Long Cruises are great. One really has the opportunity to relax and get to know the ship and meet new friends. 2. 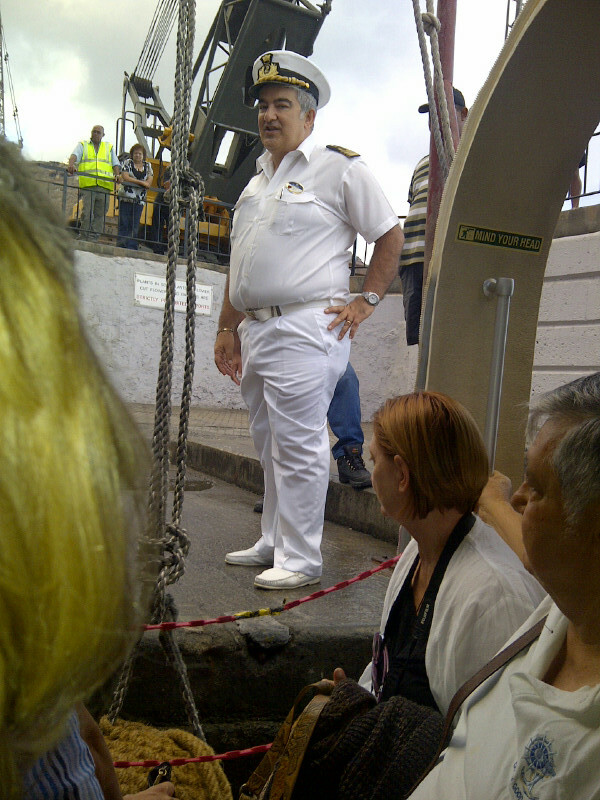 The captain for the effort he put in to getting us onto St Helena. He spent the whole morning on the jetty assisting the passengers on and off the ferries. 3. The free tea, coffee and snacks. This was a great improvement form the last trip I when with the MSC Sinfonia. 4. Large selection of good food and when the mood takes you, you can also make yourself a hamburger. 5. A gym with the best view. 6. Fanie du Preez of Kuiseb Delta Adventures the best excursion I have been on. 7. St Helena and the friendly islanders "the Saints". 8. Cabin service, your beds are made up for you and if you have an afternoon snooze the bed is made up again while you are at dinner. 9. Finally the most important one for my wife, no decision for what to make for dinner. Only problem is what not to eat. 28 April 2013. Rating 5/5 : At last! The big day has arrived and the cab has arrived to pick the four of us, mom, dad, two children aged 10 and 15 - up to go to Cape Town harbour to embark on our cruise to ST Helena Island! What a wonderful site it was to see the MSC Sinfonia docked in the harbour and knowing soon we will be sailing away. The children were very excited as it was their first cruise but our fourth, but first time on the Sinfonia. We were asked to embark earlier as the Sinfonia needed to leave earlier due to bad weather conditions expected in Cape Town later that day. We were delighted to go earlier and embarking went very well, in fact better then previous times. We were on a high with excitement. As we were early, cabins were not ready due to the fact that passengers needed to embark earlier, and we had lots of time to explore the Sinfonia while other guests were still coming on board. We had cruised on the Melody before and were sad that she was no longer in use in South Africa but we were pleasantly surprised at how big and well laid out the Sinfonia was. 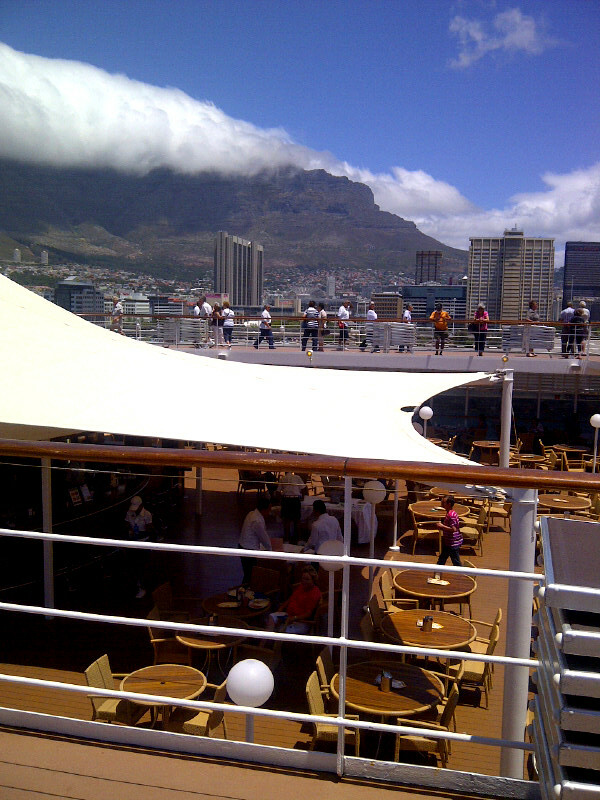 From when we cruised from Cape Town the service and entertainment was great and we were treated like royalty. The kids were well entertained and had a ball and we had time to enjoy ourselves. Arriving at St Helena we were devastated when the captained announced that we would not be able to disembark due to the high swells. 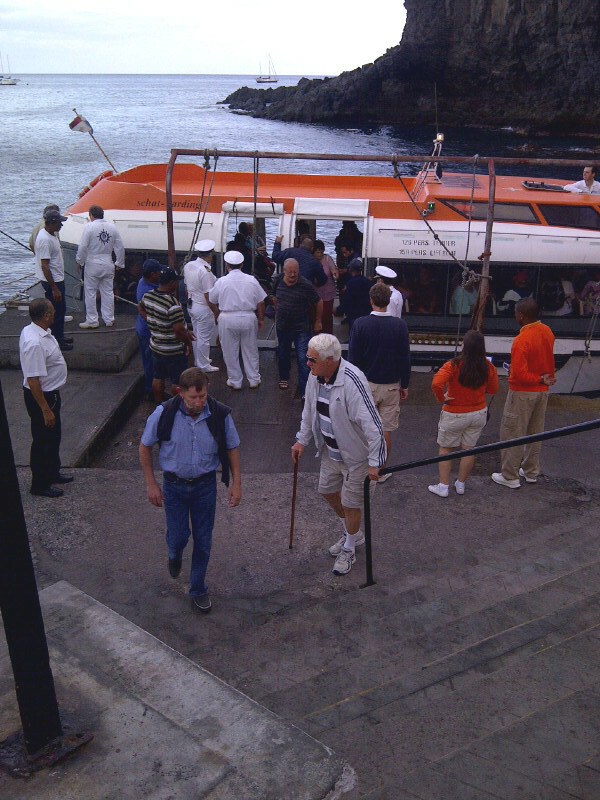 I need not tell you how disappointed and angry the passengers were as we all came on the cruise to see St Helena! We were told that the captain would address the passengers and give an update re his decision not to let us disembark. We thought that he was being very brave facing the angry passengers. Unfortunately the captain was booed by a lot of passengers as he entered the lounge. He was rather shocked and taken aback and admitted he has never been booed in his whole career! Some of us couldn't believe it as the captain is responsible for the passengers and crews safety and needs to make the right call for all. Nevertheless the captain advised that he had been in contact with the ships owners and had negotiated that the ship stays overnight so that if weather permitting we could go ashore early in the morning. He received a lot of cheers for that and we all were excited and not daunted by the fact that the ship would have to sail faster to make up time and that could cause people to do the 'Sinfonia' cha cha (Ed: the Sinfonia cha cha is the dance you do whilst walking on the boat during rough seas). Luckily the weather was great and the life boats could take us ashore, under the watchful eye of the captain. What a lovely site it was approaching the island and the tour operators were great taking us around and they were well used to negotiating the narrow road that there is on the island. We were amazed at the rich history the island has and the tourist highlights we managed to see in the short time we had available. The Saints (the locals are referred to as Saints - we weren't there long enough to confirm whether this was true!) were very friendly and we were also amazed at the variety of vehicles that are on the island from old to new. Generally the consensus was that the few hours on St Helena Island was not enough to explore and experience the life on the island. It would have been great to have a few days extra to explore the island. Nevertheless it was a great experience and we thank the captain and MSC for making it possible for us to go ashore. The trip back was fine and nobody got sick or did the Sinfonia cha cha - the whole cruise was extremely smooth going. I couldn't believe how smooth it was. The kids didn't understand why I was giving them sea sick tablets as it was as smooth as sailing on the Vaaldam! It was with great sadness when our cruise came to an end but we will definitely be back for local cruising. The cruising bug has bitten us and we looking forward to cruise on the Opera to Southhampton next year as well. We can't understand why we did not go on cruises before as it's really a holiday that's affordable with good restaurants, shows etc all under one 'roof' so to say! There's a variety of entertainment to do or you can also just chill and relax! So roll on 2013/2014 season - we can't wait to go cruising.